The Joss Northeast 9-Ball Tour will be hosting its 3rd "Joss Junior 9-Ball Championship" on Jan. 26 & 27, 2019. The event will take place at the beautiful Sharp Shooters Billiards & Sports Pub in Amsterdam, NY - www.sharpshootersbilliards.com . At Sharp Shooters there is something for everyone. From a friendly game of Pool, Foosball, or Darts to meeting friends out for some great food, drinks & to watch the game - Sharp Shooters has it! And now they even have professional Bocce Ball courts downstairs. A fun and friendly atmosphere for all ages! Tim & Julie Berlin have been most generous to our tour having 3 regular season events both at Sharp Shooters and Trick Shot Billiards & Sports Pub, and now donating the use of their room for our Junior event. Many thanks to them for their continued support of the game. Many people and companies have generously donated products and their time to help. I would like to acknowledge and thank them all as it is because of them that each participant will receive some of their items. There will also be free raffles for the players for some of the larger items. Our generous sponsors are, in no particular order: Sharp Shooters Billiards & Sports Pub (Tim & Julie Berlin), Joss Cues (Debbie, Dan & Stephen Janes), James Sinclair (Rhythm Custom Cues), CJ & Peggi Wilkinson (Baltimore City Cues), Don Kerns, Iwan Simonis (Ivan Lee), Aramith (Ivan Lee), Phil Capelle (Billiards Press), Mark Kulungian, Andrea Duvall (Utica Billiards On The Boulevard), Matt Tetreault, Steven W. Smith, Dave Dreidel & Kevin Bauccio. And thank you to everyone else, who has been, or will be involved. Any top or Pro players are encouraged to drop by if you have the time and are in the neighborhood. I'm sure the kids would love to meet you! This time we have partnered up with the BEF & BCA to make this event a qualifier for their Junior Nationals in Las Vegas in July. More info can be found here at https://www.billiardeducation.org . For more information or to let us know of your intention to come (which is encouraged), please contact one of us. Tim Berlin at 518-944-6797, or Mike Zuglan at 518-356-7163. For those in need of accommodations, there are 2 nearby motels. Super 8, 5502 Rt 30, Amsterdam, NY 12010 - 518-843-5888 & Valley View Inn, 1351 NY Rt 5s, Amsterdam, NY 12010 - 518-842-5637. Other motels may be found by searching the Schenectady & Amsterdam NY area. On another note, I am currently taking entries for our $25,000 Added "Turning Stone Classic XXXII 9-Ball Open" to be held on August 22-25, 2019. I strongly suggest entering now to avoid being shut out as I currently have about 50 paid entries and I have only been accepting entries for less than a week!!. Contact me at 518-356-7163 for entry info. Congratulations to our new Joss Junior Champions Frank Spain III in the 18 & under division and Bryzen Manipula in the 12 & under. Both players went undefeated in their respective divisions to claim their titles and qualify to go the the BEF/BCA National Championships in Las Vegas in July. Also qualifying for the nationals was 2nd place finisher in the 18 under, Justin Bogdanffy and 2nd and 3rd finishers in the 12 under, Nico Famiglietti & Dereck Graven. Our formats for the events were, double elimination races to 9/7 on the 9 footers for the 18 under and races to 7/5 on the 7 footers for the 12 under, played at the beautiful Sharp Shooters Billiards & Sposrt Pub in Amsterdam NY. It was a fun day of pool watching these talented youngsters compete with some as young as 7 years old. 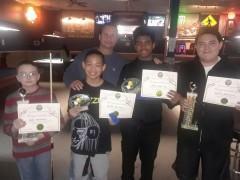 Most were playing in their first tournament ever. Everyone seemed to enjoy themselves even though they were very serious in trying to win. All players were treated to a table full of donated items to choose from, plus free raffles for the larger items and many thanks go out to the many people and companies that generously donated products and their time to help. Our generous sponsors are, in no particular order: Sharp Shooters Billiards & Sports Pub (Tim & Julie Berlin), Joss Cues (Debbie, Dan & Stephen Janes), James Sinclair (Rhythm Custom Cues), CJ & Peggi Wilkinson (Baltimore City Cues), Don Kerns, Iwan Simonis (Ivan Lee), Aramith (Ivan Lee), Phil Capelle (Billiards Press), Mark Kulungian, Andrea Duvall (Utica Billiards On The Boulevard), Matt Tetreault, Steven W. Smith, Dave Dreidel & Kevin Bauccio. And thank you to everyone else involved.